Nmap is a very popular and powerful security scanner that has been in development for over a decade, and can be used to discover network hosts and services that are in use in large network environments or on just a single host computer. It is unlike any simple port scanner where you enter an IP address and it will sweep through 65535 ports to look for any open ports and inform you the common service that is normally running on that open port. Nmap is able to accurately detect the service and version even if the service is running on some obscure port. Another well known feature of Nmap is the ability to tell what operating system is on the machine. It also supports scripting allowing users to write and share simple scripts using the Lua programming language which helps to automate a wide variety of networking tasks. One example is a built-in script that is able to detect whether a host is infected with the Stuxnet worm. The current version of Nmap 6 has made vast improvements to the scripting engine and now contains nearly 300 scripts. As good as all that sounds, Nmap may not be very user friendly because it is a command line only application that requires the user to input command line options. If the Nmap program sounds like something that would appeal to you, but you don’t relish the though of exclusively using the command line to run it, you can use Nmap’s official graphical user interface frontend and results viewer called Zenmap. Zenmap is already included in the Nmap self-installer and during installation, just make sure that Zenmap (GUI Frontend) is checked, which it should be by default. 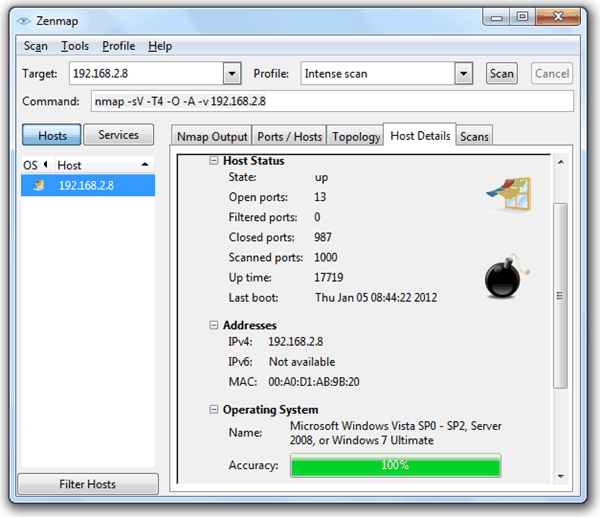 Using Nmap will be a piece of cake with the Zenmap GUI installed. Just enter the IP address or hostname at the Target box and select a profile followed by clicking the Scan button. There are 10 built-in profiles ranging from a quick or ping scan, up to a comprehensive scan which will throw in evey scanning option at Nmap’s disposal. Selecting any of them will automatically update the arguments on the command line so you don’t need to figure them out through the manual. You can customize or just check the scan profiles by clicking the Profile from menubar and select Edit Selected Profile. Nmap is free and open source and is a cross platform utility running on Linux, Mac OS X, Windows, and many UNIX platforms. Like so many other utilities of this type, the Windows Packet Capture (WinPcap) is required to be installed but is included in the package installer. Other than security analyst and hackers uses Nmap, it also has been used in a couple of movies such as Matrix Reloaded, Bourne Ultimatum, Die Hard 4 (Yippee Ki-Yay!) and a few more.